How can you use ETFs to navigate interest rate changes at the Fed? Bonds and interest rates have an inverse relationship, so when interest rates rise, bond prices (and total returns) fall. WisdomTree partnered with Bloomberg, Barclays, and BofA Merrill Lynch to create a family of five unique bond ETFs that can help investors navigate rising interest rates, while maintaining exposure to familiar strategies (and potentially supplementing income). The WisdomTree Interest Rate Hedged U.S. Aggregate Bond Fund (AGZD) can help investors maintain traditional bond exposures while decreasing their overall sensitivity to rising interest rates. The WisdomTree Negative Duration U.S. Aggregate Bond Fund (AGND) can help investors maintain traditional bond exposures while decreasing their overall sensitivity to rising interest rates. The WisdomTree Interest Rate Hedged High Yield Bond Fund (HYZD) can help investors reduce the interest rate risk of their overall portfolio while supplementing income levels. The WisdomTree Negative Duration High Yield Bond Fund (HYND) can help investors reduce the interest rate risk of their overall portfolio while supplementing income levels. The WisdomTree Floating Rate Treasury Fund (USFR) seeks to track the price and yield performance of the Bloomberg U.S. Treasury Floating Rate Bond Index. Many investors view the Barclays U.S. Aggregate Index (Agg), as a broad approximation of the U.S. investment-grade1 bond market—and mirror it for much of their core bond portfolios. In the current environment, however, investors may face increasing volatility and low levels of income from this subset of the fixed income markets. AGZD essentially combines a long position in cash bonds representative of the Agg with a short position in Treasury Bonds and/or Treasury futures to target the zero interest rate exposure. Investors can use the portfolio as a stand-alone tool for combatting rising interest rates or combine it with other interest rate-sensitive assets in their portfolio to target their desired level of risk. 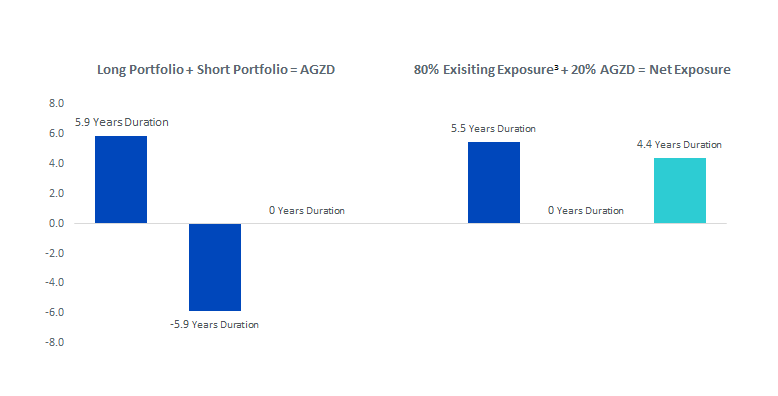 As shown in the hypothetical allocation below, by allocating a portion of their overall portfolio to AGZD, investors can reduce their overall exposure to interest rate risk2. ᶟHypothetical 80% Existing refers to exposure to the Bloomberg Barclays US Aggregate Bond index. The Bloomberg Barclays US Aggregate Bond Index represents a generic proxy for an investor’s investment-grade bond portfolio. 1Bonds with ratings of BBB-/Baa or higher are considered investment grade. 2Interest rate risk: The risk that an investment's value will decline due to an increase in interest rates. 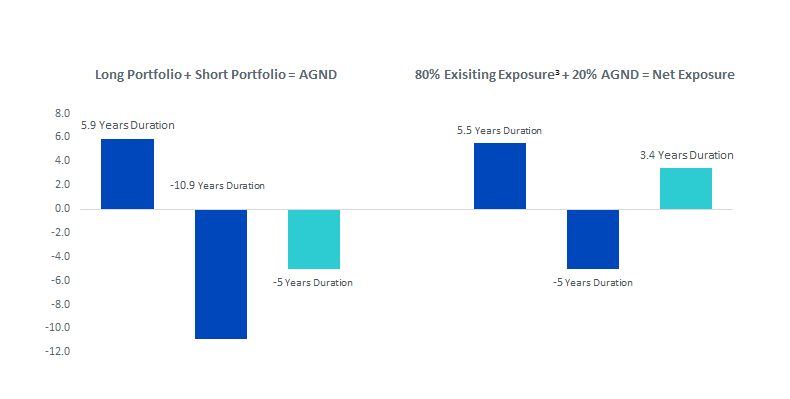 AGND essentially combines a long position in cash bonds representative of the Agg with a short position in Treasury Bonds and/or Treasury futures to target the negative interest rate exposure. Investors can use the portfolio as a stand-alone tool for combatting rising interest rates or combine it with other interest rate-sensitive assets in their portfolio to target their desired level of risk. As shown in the hypothetical allocation below, by allocating a portion of their overall portfolio to AGND, investors can reduce their overall exposure to interest rate risk2. High yield bonds continue to be one of the most popular segments of the fixed income market. But as concerns about credit risk trend lower, fear of interest rate risk is on the rise. 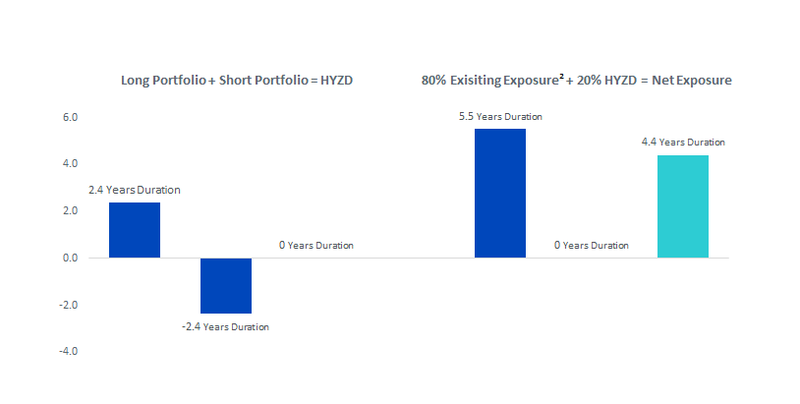 HYZD essentially combines a long position in cash bonds from the BofA Merrill Lynch 0-5 Year US High Yield Constrained Index with a short position in Treasury bonds and/or Treasury futures to target the zero duration exposure. When incorporated into a core fixed income portfolio, HYZD could provide many benefits in a rising rate environment. 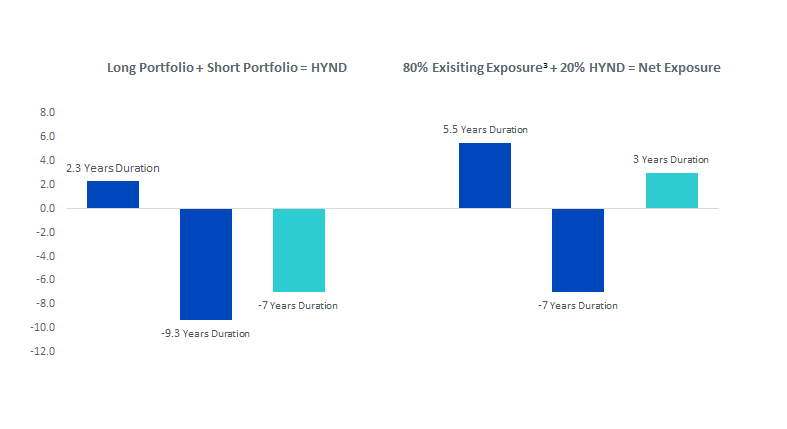 As shown in the hypothetical allocation below on the right, by allocating a portion of their overall portfolio to HYZD, investors can reduce their overall exposure to interest rate risk1. ²Hypothetical 80% Existing refers to exposure to the Bloomberg Barclays US Aggregate Bond index. The Bloomberg Barclays US Aggregate Bond Index represents a generic proxy for an investor’s investment-grade bond portfolio. 1Interest rate risk: The risk that an investment's value will decline due to an increase in interest rates. High yield bonds continue to be one of the most popular segments of the fixed income market1. But as concerns about credit risk trend lower, fear of interest rate risk is on the rise. HYND essentially combines a long position in cash bonds from the BofA Merrill Lynch 0-5 Year US High Yield Constrained Index with a short position in Treasury bonds and/or Treasury futures to target the negative interest rate exposure. When incorporated into a core fixed income portfolio, HYND could provide many benefits in a rising rate environment. As shown in the hypothetical allocation below, by allocating a portion of their overall portfolio to HYND, investors can reduce their overall exposure to interest rate risk2. 1Sources: Bloomberg, BofA Merrill Lynch, as of 12/31/13. In response to the growing demand from investors looking to reduce interest rate risk, the United States Treasury is issuing floating rate notes (FRNs)1 for the first time in its history. We believe this new class of issuance is an attractive option for investors looking to limit their exposure to credit risk2, while maintaining the potential to benefit from increases in interest rates. 1Floating rate notes: A debt instrument whose coupon payments are tied to a short-term borrowing rate such as a US Treasury Bill Rate or the London Interbank Offered Rate (LIBOR). 2Credit risk: The risk that a borrower will not meet their contractual obligations in conjunction with an investment. 3Treasury bill: A short-term debt obligation backed by the U.S. government with a maturity of less than one year. 4Treasury bonds: A debt obligation backed by the U.S. government with a maturity of more than ten years.